69 Hutcheson Street, Glasgow. G1 1SH.Tel: 01415522463. The Court Bar was established in 1881 by Gertrude Gifford. Gertrude was born in England in 1835, when she came to Glasgow with her parents at an early age she never found a partner and never married, she stayed with her mother Mary in the Gallowgate with a domestic servant Helen Bell until her death. She also owned a small pub in Glassford Street. In 1885 Alexander Taylor took over the licence, he was a well known publican in the east end of the city having premises in Springfield Road. In 1899 Alexander was paying an annul rent of £45.00 for his pub in Hutcheson Street and £70.00 for his other premises. 1908 a new licensee was serving the local here, William Simpson ran the pub until the end of the 1930s then his son took over until the end of the Second World War. He was taken to Danny Brown’s in St. Vincent Street, shown into a reception room, and found all his regulars waiting to toast him. The big night out had been prepared in secret as a surprise and tribute to Joe, and was presented with a silver salver and crystal set. Joe sadly died two years later in 1971. The pub still retains it’s 1950s decor with wall panelling and peach mirrored glass. At weekends the leather gay men frequent this well established hostelry. Joseph Ingman second from the left. Playing Dominoes.The other men were friends of the Hanging Judge. 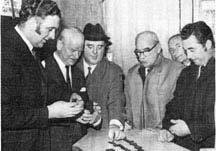 The photograph above was taken in 1970 it shows Joe Ingman and friends playing Dominoes. A gift was among the last bequests from one of Joe’s customers, the late Councilor William Cockburn, called The Hanging Judge, because of the heavy sentences he handed out while he was a police judge at the Govan and Central courts. He also left badges which he collected during his bowling days when he played against England, Ireland and Wales and Inter-City matches. In 1971 Joe Ingman died at the age od 64. The Court Bar was a haunt to business men, lawyers, police, surgeons, journalists and the man in the street. 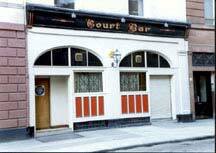 The Court Bar stands in the shadow of the City’s Sheriff Court, now defunct. Mr Ingman was a native of Bishop Auckland, Co. Durham. He was taken to Danny Brown’s in St Vincent Street, shown into a reception room, and found all his regulars waiting to toast him. The big night out had been prepared in secret as a surprise and tribute to Joe, and he was presented with a silver salver and crystal set. 71 Hutcheson Street. Blue Bell Tavern, William Hannah.